A new gallery of interior photos of the Regal in Saltcoats has been added, thanks to the generosity of Paul Francis. These were taken in June 1985, shortly before the cinema closed, and while it was being run by Kemp Cinemas. New pages have been added for Auchinleck, Catrine, Dalmellington, Kirkconnel, Langholm, Whithorn, and Wigtown, as well as new 1985 photos of the Lonsdale in Annan, the Gaiety Theatre, the Odeon, Orient and Ritz in Ayr, the Regal in Armadale, the George in Beith, the Palace in Castle Douglas, the Cumnock Picture House, the Picture House in Dalbeattie, the ABC / Odeon and the Electric Theatre / Theatre Royal in Dumfries, the Picture House in Galston, the Regal in Girvan, the Prize Cinema in Gretna Green, the Globe in Johnstone, the Radio and Picture House in Kilbirnie, the George in Kilmarnock, the Rex in Lockerbie, the Ailsa in Maybole, the Rex Newmilns, the Cinema in Newton Stewart, the Grange in Stevenston, and the Empire in Stranraer, again all thanks to Paul Francis. There are also new pages for the demolished Carlton in Edinburgh, and Glasgow's Embassy and Aldwych, thanks to Bruce Peter. Thanks to a fantastic early Christmas present of photos from Paul Francis, we can present two galleries of extremely atmospheric photos taken in 1986, of the now demolished Empire in Cambuslang, and possibly the oddest looking cinema ever, the Windsor in Carluke. Selection of updates to the Database and To-Do list, thanks to new information from John Anderson, Jim Brooks, Sybil Cavanagh, Donald Kirkbride, David Low, Willie MacFarlane, Richard McLean, Donald Munro, Pete Naples, Harry Rigby and the South Ayrshire Council archives. The Paisley Daily Express reports that the delayed 12-screen Odeon at Braehead will not open until Spring 2007 at the earlies - almost a year behind schedule. Meanwhile, a new medi-cinema is opening in January in Yorkhill Hospital in Glasgow, according to the Evening Times. There's a nice photo of the demolished Plaza, Govan on the Sunny Govan website. Ted Easdon has kindly provided a photo and information on the Pavilion / George in Barrhead, as well as a stunning playbill for the cinema from 1939. Thanks to Donald Kirkbride, we've added 1990s photos of the Alhambra and Orient Express in Dunfermline, some new photos of cinemas in Leven and Lochgelly, as well as a gallery of the ABC / Cannon in Kirkcaldy, including some interior shots. Harry Rigby has been working on the To Do List again, resulting in new pages being added for Whitburn, Armadale, and Blackburn [thanks also to Sybil Cavanagh of the West Lothian Local History Library for some of the photos]. We've introduced a new design and menu on some of the main pages, which we plan to roll out across the site. We hope you like it - comments and suggestions welcomed! 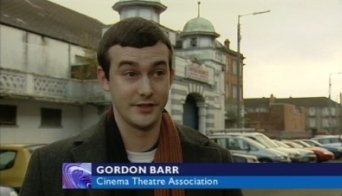 Last night's BBC Scotland Reporting Scotland news program, and the Radio Scotland Newsdrive radio news program, featured a 3 minute story about the current planning threat to the Govanhill Picture House. You can Listen Again to the radio story online here [approx 1 hr 15 mins into the program] for the next 7 days. The story was also featured in the Evening Times on November 21st. Edinburgh news roundup:The Scotsman reports that there are plans to demolish the C(s)-listed Gateway Theatre for a new development. This building has a long and complex history, and was at one stage Pringle's Picture Palace. Details of the planning application, featuring a very nice history of the site, can be found here, and the original article here. The planned makeover of the ex-Caley cinema by Luminar Leisure has been abandoned as too expensive, leaving the building closed indefinately - full story here, and the plans for the conversion of the State, Leith into flats have been put on hold due to noise concerns - details here. Interestingly, this is the same reason the previous planning application for the site last year was turned dow, but later reports suggest it is now going ahead anyway. Finally, there may be a glimmer of hope for the New Victoria / Odeon after a developer revealed plans to re-open and refurbish it as a 'boutique' cinema - full details here. The ex-Palace theatre and cinema in Aberdeen has re-opened as the 'Liquid' club after a spell of dereliction. The new Classic Grand nightclub in Glasgow - originally the Grand Central / Classic Grand cinema - apparently retains some of the original interior decoration, according to this article about the venue. During December, some of artist Adrian Brannan's original collages will be on display in the Glasgow Film Theatre. Many of his stunning images feature cinema - see the galleries on his website for details. The Greenock Town website has a nice page on the cinemas of the place here. An article called 'A Thousand Miles of Filmgoing' from a 1931 issue of Film Weekly has been added to the Articles page; this has a staff reporter visiting some of Glasgow's cinemas, including Green's Playhouse, the Black Cat and the Picture House, and talking about her impressions of cinema going in the city at that time. It also includes an interview with George Green, talking about his plans for 'Cinemas of the Future'... including gyroplane landing facilities on the roof of his cinema in Ayr! A new page for Invergordon has been added, thanks to John McNaught and Wendy Sanders of the Arts Centre there. Thanks to Bruce Murray, we have some fascinating galleries of the Glasgow Coliseum being converted from cinema to bingo use in the late 1980s, including shots that show that some of the 1930s decoration had survived behind the Cinerama curtains until this point. There are also interior pictures of the King's Dundee when on bingo, as well as some pictures of the Tivoli in Glasgow. Some more images of the stunning interior of the Govan Lyceum have been added, taken now that bingo has vacated the building, and it is now up for sale. An archive shot of the original Lyceum theatre, which the cinema replaced after it burnt down, is also now on the page. New pages have been added for Dunblane and Inverkeithing, as well as updated pictures on the Dunfermline and South Queensferry pages, courtesy of Harry Rigby. Graham Kelly has sent updated photos of the Porte cinema in Burntisland. We now have a gallery of photos of the interior and exterior of the ex-Rialto in Airdrie, thanks to Bruce Murray. Further afield, a new gallery of photos of some London cinemas has been added - thanks to Eva Branscome and Richard Gray for arranging access to all these fantastic buildings. The editors of this site are now involved in running a new Scottish branch of the Cinema Theatre Association. The CTA is the national body for the protection and promotion of cinema buildings. If you're reading this, you may well be interested in becoming a member - click here for more details of the benefits. Our new role will in no way alter the projects involved on this website. Gala closed the ex-County bingo hall in the Govan Lyceum on October 8th. The B-listed building is now sitting empty. This has been covered in today's Evening Times. The Hampden Picture House is in the process of being demolished for flats; coverage in yesterday's Evening Times (complete with a rather inaccurate quote and a photograph taken from this website without permission). Film showings in the Regal / Vogue in Lanark have begun; as reported in Lanark Today. Showings are on Wednesday and Thursdays, at 6pm and 8pm. Showings next week are of Taxi Driver and Carrie. A revised planning application has been lodged for the Govanhill Picture House; (05/02663/DC and 05/01050/DC) - these involve retaining the central portion of the facade, and building new flats behind it. Unfortunately, the current building line is not respected - the entrance portico currently sticks out, with the rest of the building set back. The new plans have two large wings on either side of the entrance, coming almost as far forward as it; so the retained portion would be almost subsumed. There is also still no written supporting evidence that any attempt has been made to find a use for the building in its current form. The Evening Times is reporting that plans to extend the St Enoch shopping centre in Glasgow may involve a new multiplex cinema - it will be interesting to see if this happens - earlier plans by Warner to open a multiplex on the same site in the 1990s came to nothing. Lots of archive images, including the opening brochure, of the Regal in Lanark have been added - thanks to Mike Lee, the son of George Lee, the original manager there. More updates to the Scottish Cinema Database, thanks to Mary Barker, Allan Goodall, David Low, Willie Macfarlane, Sandy Mullay, Dave Stewart and Fionn Young. The page for the Regal in Paisley has been updated, with more information about its opening, and four new galleries of detailed photos, courtesy of Bruce Murray. Thanks to Harry Rigby painstakingly working his way through our Help Wanted list, we can now add new pages for Alyth, Anstruther, Auchtermuchty, Coaltown of Balgonie, Couper Angus, Dunbar, East Weymss, Earlsferry, Kirriemuir, Markinch, Strathmiglo, Thornton and Windygates. There are also additional cinemas on the pages for Dundee (the Caird Hall and the Gilfillan Hall), Portobello (the Picture House), and two additional possible cinema buildings in Crieff (any information on these warmly welcomed! ), plus updated images for Arbroath, Blairgowrie, Callander, Dundee Kings, Forfar, Leslie, Leven, Methil, St Andrews, and Tayport, again all thanks to Harry. Pete Naples has also supplied photos of the surviving projection room at the Caird Hall. The B-listed Regal in Kirriemuir has also been added to the Listed Cinemas page. In other news, the Studio Cinema in Fort William is to close today, according to the Oban Times. Coverage of the launch of the Cameo 500 in the Edinburgh Evening News. The BBC news website reports that work is commencing on the restoration of the Bo'Ness Hippodrome. 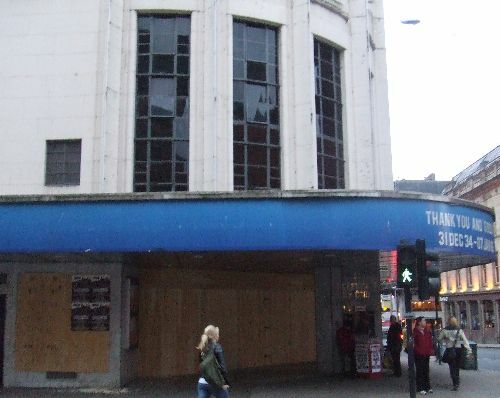 The ex-Ritz cinema in Rothesay is up for sale - details here. An updated page for the Plaza in Port Glasgow, incorportating three detailed galleries of interior photos courtesy of Bruce Murray, has been added. This is quite timely given that Gala bingo are currently refurbishing the building. Thanks to Bruce Murray, we now have a fantastic series of galleries of interior photos of the stunning Lyceum in Govan, showcasing both the current use of bingo in the stalls, as well as the disused circle space, last used as a cinema in 1981. A new section for Articles has been added to the main page; it provides a focus for our existing articles on the George Palmer circuit, and being an Edinbugh Projectionist. It also gives a place to present a new detailed article by Tom Widdows on James McKissack, one of Scotland's most prolific cinema architects. New archive photos have been added on the pages for the Ascot, Astoria, BB Cinerama / Odeon and Picture House / Gaumont cinemas in Glasgow, the Regent / Odeon in Aberdeen, the Kings / Gaumont in Dundee, and the Odeons in Hamilton and Motherwell. In addition, we have new coverage of the Empire / Odeon in Coatbridge, the Odeon in Dundee, the Regent in Edinburgh, the Odeon and the Gaumont in Greenock, the Rialto / Odeon in Kirkcaldy, and the Pavilion / Gaumont / Odeon in Falkirk. The additions above are all thanks to archive photos from Ben Dowell, and you can see many more fantastic cinema photos on his Odeon Calvalcade website, as well as order high-quality copies of the photos here. In other excellent news, the Cameo in Edinburgh has been upgraded to B-listed status by Historic Scotand - as reported by BBC News and the Edinburgh Evening News. City Screen is to launch a new membership scheme for the Cameo next week; more details after the event! Further afield, English Heritage and the National Monument Record have digitised a lot of their photo collection - including a lot of nice cinema pics. Visit the new site here. A full history and detailed photo survey of the stunning Regal / Vogue in Lanark has been added. More detailed information page, with a 1911 archive programme and current interior photos of the Frank Matcham's derelict Coliseum / Cinerama cinema in Glasgow. Some interior photos are courtesy of Lilimouse of the Urban Desertion website. The main index page has also been updated to include a new link to a directory of all of Scotland's listed cinema buildings - this is still a work in progress, so please do let us know if we've missed anything! A new page for the demolished Carlton cinema in Glasgow has been added, as has an additional picture on the page for the Douglas cinema in Milngavie. A few pictures of the Kingsway demolition have also been added. On the Thurso page, we have an updated image of the Picture House, courtesy of John Swanson, and an interior photo taken just after closure in September 1983, courtsy of Darren Manson - you can see a full gallery of these interior photos on the website of Cinema for Thurso. The Edinburgh Cameo has officially been upgraded to B-listed status by Historic Scotland - excellent news that much better reflects its importance and rarity as an intact Edwardian cinema. The page for Bo'Ness has been completely redone, incorporating a full photo survey and detailed history of the Hippodrome cinema there - probably the oldest surviving purpose-built cinema in Scotland. Many thanks for Pete Reid and Gareth Jones for allowing us access and being such welcoming and enthusiastic hosts. BBC News and the Scotsman have also featured articles on the Hippodrome redevelopment. An interior photo survey of the ex-Central cinema in Leith has been added - highlighting the surviving plaster screen, still being used by the new owners Destiny Church to project films on to. Many thanks to Peter Anderson and the staff of the Destiny Church for giving us a tour of the building. The page for the Helensburgh La Scala has been upgraded with additional photos and information, courtesy of Phil Worms. All of the Inverness pages how also been tidied up and added to, thanks to new information from Allan Goodall. More detail about the interior of the Hillhead Salon has been added, thanks to Frank Watson and Jim Mitchell, and the Kingsway has been moved to the Demolished section of the Glasgow index page. Images of the demolished Regal, Blairgowrie have been sent in by Dave Stewart, and more information has been added to the Grangemouth page. Plans to convert the State cinema in Leith to flats, retaining the foyer block, have been passed, according to the Scotsman. A gallery of some interior photos of the Coliseum, Eglinton Street can be seen on the Urban Desertion website. Further afield, we've added a gallery of photos from the the last night at the Odeon in York (following a 467-mile round trip from Glasgow especially to catch the last film!). A new, more detailed history of the B-listed Salon in Hillhead has been added, incorporating stunning interior photos just before it closed as a cinema courtesy of Bruce Peter, and archive materials thanks to Chris Doak. This timely update comes as owners G1 Group have submitted a new planning application (06/02511/DC and 06/02512/DC) to further alter the building. This would involve replacing the Glasgow-style art nouveau panels on the exterior with similar designs in back-lit glass, to open out the entrance vestibule by removing the modern glass doors, to insert three sky-lights in the ceiling to get more light into the building, and to extend the balcony level right across to the screen, creating an additional 60 square metres of floorspace for the restaurant. The Kingsway in Cathcart has finally been demolished - but not until after the long-running saga took a final controversial twist - as demolition began before all of the planning conditions for demolition consent had been met. Edinburgh Cameo owners City Screen have issued a press release declaring that they will withdraw the Cameo from sale, and keep the it open as a cinema. Their new plan is to raise funds in order to undertake improvements which they hope will help it to compete against strong continuing local competition. The plans include upgrading the frontage, rejigging the foyer and revamping Screen 2. They have pledged that the plans to drastically alter the historic main auditorium have been shelved. Fantastic news. The Save the Cameo campaign website has updated with a new message from Genni Poole in response to this development. This was featured on a BBC News website story, along with a photo from and link to this website! The B-listed Coliseum in Eglinton Street was sold in March to new owners for £50,000, apparently for residential redevelopment. A new music venue, called the Classic Grand, is to open in October in what was the Grand Central cinema in Glasgow, according to the Sunday Mail. Work has started on the ex-La Scala cinema in Helensburgh in order to turn it into a Barracuda pub. Thanks to information and photos from Andy Simmonds, a new page has been added for Doune, as well as one for Auchtermuchty, thanks to Norrie Mcnamee. Andy Simmonds has also provided an archive shot of the Pavilion, Alloa. David Low has sent a 1910 advert for the Miller's New Electric Theatre & Buckie Skating Palace, in Buckie, as well as some photos from an exhibition on the Playhouse in Huntly. Ron Thomson has has given us some wonderful 1915 archive material on the Picture House, Denny. There are new photos on the Ballater page, thanks to Helen Hopwood, and also a postcard archive exterior of the Picture House, Broughty Ferry. 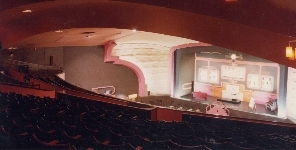 Allan Goodall has provided detailed information about the history of the Playhouse in Peterhead, the Picture House in Banff, and the Playhouse in Nairn, as well as some pictures from them in the 1970s. Added more information to the Auchterarder and Crieff pages, thanks to Willie Macfarlane, and Jim Brooks has sent some interiors of the Beach Ballroom in Aberdeen. The manager of the Picture House in Campbeltown has sent us an updated exterior photo now that the exterior renovations have been completed. In cinema news, the B-listed Coliseum in Eglinton Street was sold in March to new owners, apparently for residential redevelopment. The controversial Kingsway saga continues... an application (06/02195/DC) was published on June 29th to try remove one of the planning consent conditions required for demolition of the building - namely that no demolition should take place before legal contracts were in place for the replacement building. This had a 3 week consultation period, but demolition started anyway the week beginning the 7th August - well before the consultation period had closed! 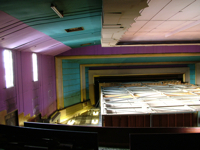 Local MP Tom Harris has published a gallery of interior photos from the B-listed Toledo / ABC Muirend, taken just before demolition of the auditorium in 2004, which show some of the then surviving atmospheric decoration - which has all now been lost. The amusements in the former Birks cinema in Aberfeldy have closed, and the building is for sale. Local residents have established a 'Friends of the Birks' to investigate the possibility to reopen it as a 100-seat community venue and cafe, despite the fact that competing plans to convert it to a restaurant, bar and fast-food venue were passed in November 2005. Further afield, we've added a basic gallery for Dublin cinemas. Updated page for Montrose, featuring archive photos, plans and other information about the now-demolished Playhouse cinema there. Thanks to Chris Doak for the archive material, and to Allan Goodall for memories of the building. Updated page for Troon, with new demolition photos courtesy of Alistair Mulhearn; also thanks to John Bigham for additional information. A new photo survey and more detailed history of the Caledonian Associated Cinemas flagship cinema - the Playhouse in Perth - has been added. Thanks to Gavin MacKenzie and Cairnstar Limited for giving us access and taking the time to show us around. A gallery of 1970s interior photos of the Playhouse in Edinburgh has also been created, thanks to John Storrier. Glasgow City Council has formally granted permission to completely demolish the B-listed Kingsway cinema in Cathcart, and build flats on the site. The bingo in the B-listed New Tivoli cinema has closed, and the building is now up for sale. This opened in 1934, designed by James McKissack, and was a redevelopment of an earlier 1913 cinema on the same site - the current facade incorporates elements dating back to this original building. The interior is largely intact, and retains decorative coloured glazing in internal doors, as well as etched deco glazing on the exterior. Carlton blamed the loss of takings following the introduction of the smoking ban in all enclosed public places in Scotland earlier this year. Others to have closed recently because of this is the Premier Bingo in Denny, and the Rio in Kirkcaldy. The Mecca bingo in the ex-Coliseum cinema in Fountainbrige has moved to a modern site nearby, leaving the building empty. This opened in 1911, a conversion of a roller skating rink, and was part of a cine-ballroom complex also incorporating the Palais de Dance. Cinema portion closed in 1942. The long-running planning wrangles over the site now appear to have been resolved and the building will be demolished in the near future. The bingo in the ex-Palace cinema in Inverness has moved to a new site at Inshes. The Palace could be redeveloped for housing, despite it being the only remaining cinema building in Inverness. Alterations to the B-listed ex-Caley cinema in Lothian Road in Edinburgh to make it more suitable for live music use involve removing extra floors in the stage space, and returning the focus of the building to being the proscenium. Planning link here. North Lanarkshire council have granted an application to alter the C-listed Cinema Picture House / Gaumont / Classic in Wishaw for restaurant/bar use. (Refs: S/06/00554/LBC and S/06/00530/FUL) From the descriptions the exterior is to be restored under the plans and the original windows retained and repaired. The interior is to be altered to create a new rear opening to a terrace. Ground floor will have a bar/lounge with dance floor and kitchen facilities; a new dining area and mezannine floor will be created on the balcony. The proposals 'seek to preserve much of the original ornate character still existing and make best use of the former cinema auditorium'. A new homepage for the Tivoli Theatre Trust in Aberdeen can be found here. Big updates to the cinema Database, thanks to new information from Willie MacFarlane, Paul Meechan, Kenneth Duncan, Allan Goodall, Bill Penman, George Will & Geoff Ruderham, and Jim Towle; plus information from the 1938 and 1953 Kine Year Books. The rather striking ABC Clock from the ex-Regal, Paisley, is now in the hand of Renfrewshire Museums. Unfortunately, the New Victoria / Odeon in Edinburgh is not to be used as a Fringe Festival venue again this year. The Scottish Cinema Organ Trust has the original cinema organ consoles from both the Odeon Renfield Street, and the Wurlitzer from the Edinburgh New Victoria in their care. The Rialto in Lochee is to be converted to a children's play centre; and the Roxy in Kelso seems most likely to become a restaurant. Again thanks to the CTA Archive and Clive Polden, we have a new page for the Elder cinema in Govan, a rare interior shot of the Elephant in Shawlands, and for the La Scala in Sauchiehall Street, closeups of the proscenium and organ, as well as a watercolour of the auditorium. Courtesy of Frank Watson, we now have colour photos of the Pavilion in Wick, and the Picture House in Thurso. Laurel and Hardy club the Sons of the Desert are staging monthly film showings of various classic L&H films at the Britannia Panopticon - the site of Stan Laurel's stage debut. Film showings are held on the first Wednesday of every month, free admission, doors open 6.30pm. See here for more information. The Eglinton Electreum featured in a recent Evening Times Times Past feature. Futher afield, a page for Colchester has been added, thanks to Anna Collins. More new pages of demolished Glasgow cinemas have been added, thanks to Clive Polden and the Cinema Theatre Association archive - the Boulevard, the Commodore and the Park cinemas in Glasgow. Today's Sunday Post has a full-page feature (page 40) on this website and its creators, entitled 'Hidden Secrets of Scotland's old cinemas' - if you're visiting the site after seeing the article then please look around, and if you can fill in any gaps in information or photo coverage, please get in touch! We can now exclusively present a copy of the original 50-page opening night program for the Paramount (Odeon) Renfield Street in Glasgow. Many thanks to the Cinema Theatre Association archive, and archivist Clive Polden, for permission and taking the time to scan it in! Thanks to Colin Stewart, we've added a testimonial presented to his grandfather, David A. Stewart on occasion of his retiral as Scottish General manager of ABC. 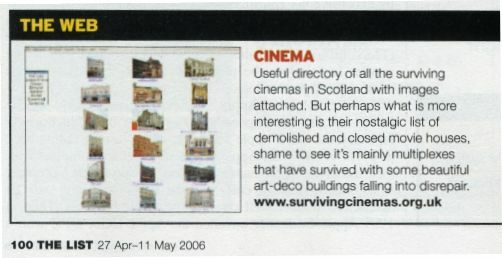 Thanks to Bruce Peter, we can now reproduce an article he wrote in 1998 about the Scottish cinema chain Associated GP Cinemas - better known as the George Circuit. Bruce has a new book on Scotland's Cinemas due out later in the year - keep an eye out for it! The Cameo campaign was featured on Friday's BBC Radio 4 You & Yours; featuring director Ken Loach speaking out in support of the Cameo, it's available to Listen Again here until this Friday. More coverage of the go-ahead for the expansion at Ayr racecourse, which may include a multiplex cinema, on BBC News and the Evening Times. The Herald had a nice feature on Barney McCue, the projectionist at the GFT here (even if it does incorrectly call the GFT the oldest operating cinema in Glasgow!). The fuss about the planning permission for the Edinburgh Coliseum demolition rumbles on in The Scotsman. There's a nice Flickr gallery of vanished cinemas around the UK. New pages have been added for the Oddfellows Hall in Edinburgh, thanks to Lee Brown, and new photos of the Alhambra theatre in Stirling, and the Victoria Hall in Linlithgow, courtesy of Harry Rigby, and the cinema in Glenrothes from Ross Camp. 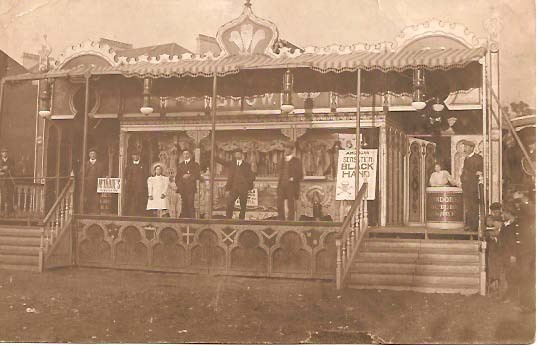 Ann Scott has sent the following picture postcard of McIndoes Picture Palace travelling show; if anyone can shed any light on the history of the show or more information on McIndoe himself, please get in touch! Fame at last - we're featured in the Web section of this fortnight's List magazine! The Scotsman reports that the nightclub in the A-listed ex-Queens Hall building in Edinburgh may have to remove alterations made without planning permission, including lighting rigs and a raised floor area. A feasibility study is being drawn up to determine how best to re-use the derelict Leith Theatre. A nice page on the history of the Rex Picture House & Machars Mobile Picture House of Wigtown / Newton Stewart can be found here. A new gallery of photos of the ABC / Odeon Wester Hailes has been added thanks to Andy Simmonds. A new page for the mobile cinema the Screen Machine has been created, thanks to photos from Graham Campbell. Thanks to Norrie Macnamee and Joe Skivington, a new page for the Innerleithen Playhouse has been added. We can also now present a stunning new gallery of interior photos from the Regal in Paisley. After over two years of considering the application, Glasgow City Council has finally granted planning permission to completely demolish the B-listed Kingsway cinema in Cathcart in Glasgow, and replace it and the green space behind it with flats. Coverage of the fiasco in the Evening Times. Plans to run the Cameo and Filmhouse cinemas in Edinburgh as a single entity look likely to have fallen through, according to reports in the Edinburgh Evening News. Plans to demolish the ex-Palace in Burntisland in Fife after it was compulsorily purchased by the local council appear to be proceeding, according to a report in Fife Now. The opening of the Odeon at Braehead may be delayed up to 6 months, after structural problems culminated in part of a concrete ceiling collapsing into one of the auditoria. See coverage in the Daily Record and BBC News. According to the Theatres Trust, the Webster Theatre in Arbroath is to be refurbished and expanded. This opened as the Webster Hall in 1867. The ex-CAC Cinema (now bingo hall) in East Kilbride is set to be demolished under new plans for the town centre, as reported by BBC News. A new site has been created by Darren Manson to cover cinemas in Thurso, which features the Thurso Picture house - visit the site here. An exhibition about the Huntly Playhouse, featuring photographs by artist Elsebeth Jorgensen and including a film screening by ex-projectionist Gordon McTavish, is being held at 7.30pm on Thursday 27 April at Stewarts Hall in Huntly. 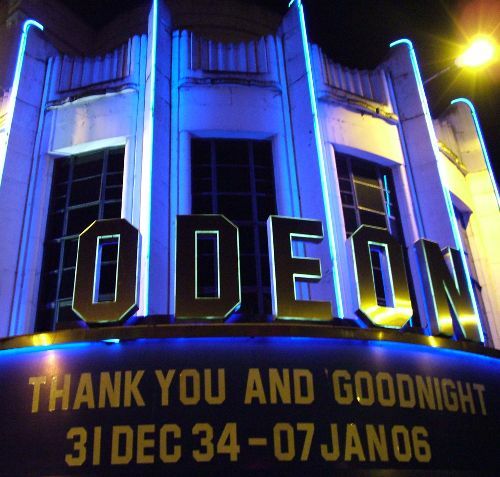 Further afield, Odeon have announced that the Odeon in York is to close its doors some time in August. A planning application has been submitted to radically alter the interior of the A-listed 1893 Old Athenaeum theatre into retail space – the stalls floor is to be retained as is, but the balcony raked floor is to removed entirely & made flat at the approx level of the top of balcony front (this also means the loss of the mezzanine bar/cloakroom under the balcony). A new glass balustrade is to be fitted round the balcony front. The stage will be removed and made level with current stalls floor level. Several new floors, a new staircase and liftshaft are to be inserted into current stage / fly area. A new floor at balcony front level in the stage area will be accessed directly from balcony side slips, opened out at their ends to new 'link floor' right across the front of the proscenium. The application numbers are 06/00590/DC and 06/00591/DC, and the closing date for any comments is 25th March. Perth Councillors are to consider plans to radically extend and alter the B-listed Playhouse cinema in Perth. The plans would see two new 100-seat screens being constructed on waste ground alongside the current building, but also involve the removal of the rake in the current screen 1 (original balcony) to allow its use as a 'Restaurant Bar and Screening Room', very like the one that was proposed for the Cameo in Edinburgh. The Evening Times reports the artist Pauline Goldsmith has been awarded £30,000 to put on a performance art show investigating the history of the Govan Lyceum, and the earlier Lyceum theatre that was demolished to make way for the cinema on the same site. The cinemas in Oban and Fort William are currently up for sale as the current owners wish to retire. They are being sold as a going concern. Coverage of the closeure of the ex-Regal in Paisley as a bingo hall can be found in the Paisley Daily Express. An updated history and photo gallery for the Rosevale in Partick has been added - thanks to Major Martin Whyte-Holt for granting us access, and to Bruce Peter for the archive photos. Gala have decided to close the bingo hall in the ex-Regal in Paisley on March 5th, due to its proximity to of one of their more modern sites. Brian O'Malley managed to get some nice interior shots of the place, and Jim Brooks has contributed a ticket from 1968. Harry Rigby has kindly provided a couple of interior shots of the Grangemouth La Scala. The Glasgow pages for the Pavilion Theatre, the La Scala, the Picture House / Gaumont, and the Cineworld multiplex have been updated with additional photos, and there is a second gallery of demolition photos of the Hamilton Regal. Thanks to more photos from Chris Doak, there are better archive shots of the Orient, the Metropole, and Cranston's Cinema DeLuxe. He has also kindly provided some additional photos for the Greenock pages. A selection of archive postcards have been added to the pages for the Ayr Odeon, Aberdeen His Majesty's Theatre, Kings Theatre Glasgow, the Picture House Newton Stewart, and the Glen, Paisley. BBC News is reporting that the Roxy in Kelso is to be turned into a restaurant and function suite, but in happier news the Bo'Ness Hippodrome is to form the centrepiece of a £5M town centre refurbishment plan, according to the Daily Record. A new page has been added for Darvel in Ayrshire, thanks to Norrie Mcnamee, and there are additional shots on the Elgin page, thanks to David Low. Further afield, we have post-closure photos of the Berwick Playhouse from Malcolm Crow, a new page for the cinema in Wivenhoe, courtesy of Anna Collins, and a gallery of cinema photos from New Zealand, thanks to Tom Widdows. Various updates and corrections to the Database have been made, thanks to information from Ryan Moir, Paul Hunter, Walt Davidson, John Robb Mcnab, Ian Ross, Pete Naples, and David McNay. A new thorough history and photo survey of the ex-Broadway cinema in Prestwick has been added, showing the wealth of original features that still survive inside, despite its conversion to squash courts! Many thanks to the Buzzworks Group for the opportunity to tour the building, and to Bruce Peter for the archive photos. Two new archive galleries have been added - interiors of the Odeon Ayr before it was tripled, and the short-lived Odeon multiplex at the Stack, Dundee, both thanks to Jim Duncan. A set of interior pictures from the Regal Lossiemouth in its current incarnation as a furniture have been added, thanks to David Low. Demolition is now underway at both the Hamilton Regal, and the Bombay/Capitol in Ibrox. Photos of the ABC Regal demolition can be seen here. A nice piece on sculpture on the RCAHMS website features the plasterwork reliefs by John Alexander, now in the Regal cinema, Bathgate. A planning application to demolish the auditorium of the B-listed State, Leith and build flats and a restuarant has been resubmitted; coverage in the Evening News here and here, and the plans can be viewed directly here. Also in Edinburgh, the long running saga of the plans to demolish the Coliseum and Palais de Dance continues - coverage in the Evening News here and here. A new guide to Edinburgh's style and night life wrongly called the Cameo the Carrero, according to the Evening News! BBC News is reporting that permission has been granted to completely demolish the B-listed Dumfries Theatre Royal, and build a new theatre on the site. This is despite an earlier scheme for partial demolition and rebuilding was refused. A gallery of interior pictures taken just after closure of Green's Playhouse as the Apollo can be seen here, thanks to our friends at www.glasgowapollo.com. Be sure to have a look at their detailed site, which also has both a book and DVD about the building available. If you accessed the updates page via the usual links, you will have noticed a new front page explaining and introducing roughly what the site is about. Two-weeks of stripping out at the Odeon Renfield Street have now ended, and the building is now boarded up awaiting its fate. We have a series of exclusive pictures from inside during this process which will be available here very soon; as a teaser here is a rather sad then-and-now shot of Screen 1. The Scotsman is reporting that Edinburgh councillors have refused an application for a late-night Entertainment license for the ex-Odeon Clerk Street, which could have paved the way for it to be converted into a nightclub or similar use. The future for the B-listed building therefore remains uncertain. The Evening Times reports that County Bingo have been sold to Gala Bingo - the sale includes several ex-cinema buildings such as the Regal in Paisley, the Plaza in Port Glasgow, and the Lyceum in Govan. Let's hope the new owners put a bit more effort in the maintenence and upkeep of their buildings than County did. The Paramount Theatre / Odeon Renfield Street has sadly been moved into the 'Closed' section of the Glasgow cinemas page after closing last night after 71 years. A gallery of interior pictures of the Hamilton Odeon, taken post-tripling in the early 1990s has been added, thanks to Jim Duncan. Added the Langham Hall Pictures to the Glasgow page, thanks to Frank Watson. Norrie Mcnamee has provided a picture of the Little Theatre in Lockerbie, and a new gallery of demolition photos of the Phoenix in Kirkwall, Orkney thanks to Kevin Kirkness and Kenny Thomson. Graham Kelly has also provided photos and more information on the cinema in the Magum Centre in Irvine. A rather nice advert for Caledonian Associated Cinemas has also been added, thanks to Derek Mathieson. Much further afield, there is a new image gallery of the Palais Theatre near Melbourne thanks to Ross Mackay, and a photo of a cinema in Seward, Alaska courtesy of Chris Gilmore. The Database has been updated with new information, courtesy Malcolm Crow, Lesley Thomson and Chris Doak. It now has information on over 870 Scottish Cinemas! In other news, the Gateway Theatre in Edinburgh - originally Pringle's Picture Palace - has closed due to structural problems, and may be turned into flats, according to the report in the Edinburgh Evening News. The Palace cinema in Burntisland is looking likely to be demolished for flats, after the council issued a compulsory purchase order on the building - details on Fife Now. A nice set of updates to start off the new year - firstly, the new look for the ex-Rosevale in Partick, and a photo of the new Odeon Braehead nearing completion. In Glasgow, we have new archive images of the ABC Regal, the Odeon, the Toledo, the Anniesland Ascot, the Black Cat, the Bombay, Cranston's De Luxe, Grand Central, the Coliseum, the Empire Electric, the GFT, the Govanhill, the Grosvenor, the Hampden, the Imperial, the Kelvin, the Kings, the Kingsway, the La Scala, the London Road Picture Palace, the Lyceum, the Mecca, the New Bedford, the Parade, the Norwood, the Olympia, the Queens, the Riddrie, the Vitagraph, the Vogue, and the Waverley. Plus slightly further afield, we also have upgrades to our coverage of Motherwell, Hamilton, Paisley, Airdrie, Alexandria, Bellshill, Coatbridge, Dumbarton, Larkhall, Lochwinnoch, Renfrew, Saltcoats, and Wishaw - all thanks again to more images from Chris Doak. Unless otherwise specified, all photographs and other material copyright (c) 2001 - 2006 Gordon Barr and Gary Painter.